Eating in Asia requires a certain degree of guts and a wild sense of adventure. 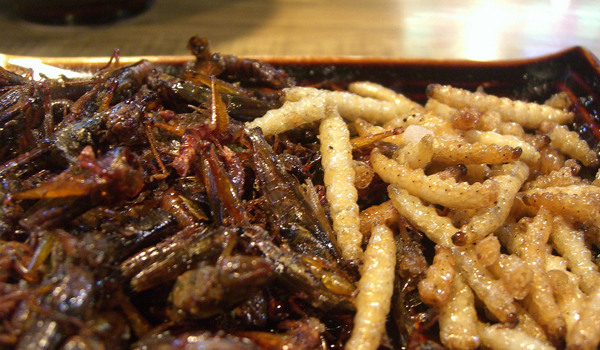 Right in the heart of Bangkok’s red-light district, street vendors peddle a huge array of deep-fried bugs – from ants to hornets, caterpillars to grasshoppers. Anything that hops and bites is fair game for the palate. Add some chili powder, and you’re in for a sizzling, jumpy ride. The boiled half-hatched egg is exceptionally crunchy as you sink your teeth into the partially-formed fetus, complete with feathers, eyeballs ,and translucent skin. The locals like to dip it in vinegar and soya sauce. The down side- you might find feathers stuck between your teeth! 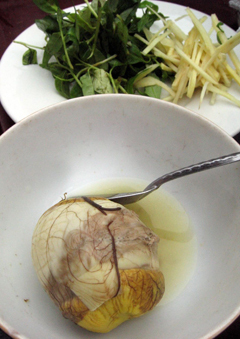 Mangababaluts (balut-makers) can be found in the district of Pateros, Manila. Have you ever thought about why only the Chinese eat dog meat? Try it for yourself and you might find out why. 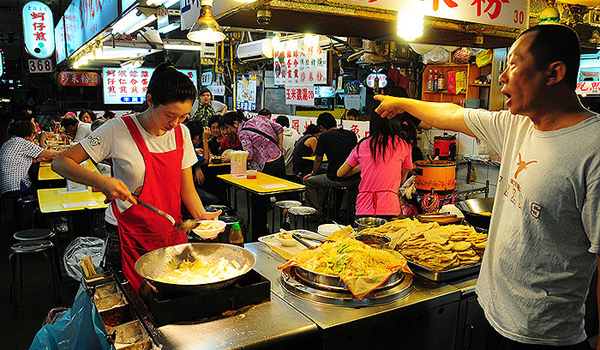 Hugely popular in Southern China, namely Guangdong and Sichuan, stewed dog meat is offered by most restaurants in winter, while some are even dedicated to selling only dog platters. Even along the bustling Meishi Street in Beijing, there are a few posters advertising dog meat for sale. Though they’re close to extinction, turtles are cooked with Chinese herbs and made into soups in the eastern world; the Chinese believe turtles are aphrodisiacs and are excellent for health. Despite all the traditional sayings, modern Singaporeans love the medicinal soup for its thick texture and herbal taste. 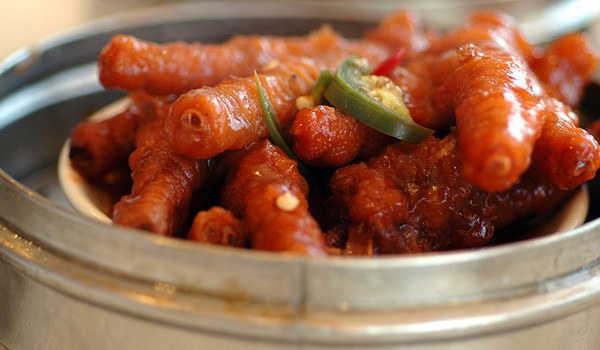 Sharp and thin chicken feet are a common delicacy in Hong Kong, Singapore, Taiwan, and China. As a popular dimsum (steamed snacks in bamboo baskets), chicken feet are stewed in black bean sauce and steamed for a long time before the soggy skin crumples and the cartilage becomes chewy. Be careful of the chicken’s toenails though: you don’t want to choke on them! Bouncy balls bigger than you’d imagine, with thin veins and a tight plump texture, these testicles are only suitable for the daredevils with the balls to try them. The male chicken testicles are usually boiled and eaten simple and plain, but you can always ask for spicy stewed or garlic stir-fried. With a tight skin like a sausage, the interior of the testicles taste soft and tofu-like. Be sure to find some in the famous Snake Alley Market in Taipei. There is nothing exotic about tofu (bean curd), unless it’s of the overwhelmingly strong variety! ‘Chau’ means stinky in Cantonese and the dish literally lives up to its name, smelling like a bucket of human dung left out for 2 weeks. Locals hunt down this fermented and deep-friend goody in the Mongkok Night Markets, where you can definitely smell it from afar. 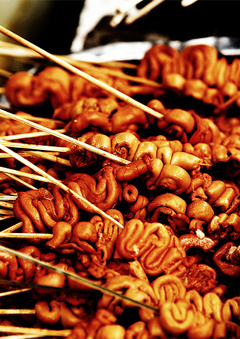 Barbecued chicken intestines are a national dish for the Filipinos, who have a soft spot for internal organs. Chicken gizzards, liver, and heart are all grilled on bamboo skewers, garnished with sweet and spicy sauce, and cooked to perfection. Not enough to satisfy your senses? You might just prefer the barbecued chicken head or pig’s ears. Known as the king of fruits in Southeast Asia, the durian’s prickly green appearance and exceptionally strong and odd (some say vomit-like) smell have led it to fame. But that’s not all there is to this quirky fruit; its yellow, soft, and tasty meat has earned durian its crown in Southeast Asia. Most foreigners frown at the thought of savoring this bitter yet sweet fruit, but soon enough, the heavenly taste is sure to win them over. Don’t forget to try the best species, D24, for the fleshy and juicy meat! Besides flying off the back of a vampire, bats can be eaten as well. Sold in Malioboro Street of Jogjakarta, bats are often smoked to crispiness. They might look gory, like skeletal brown mice, but taste like beef jerky, especially the stiff wings! Locals in Manado love their specialty – the Fruit Bat Soup, where an entire bat is cooked in coconut milk, and the soft meat on its feet and wings is savored. What’s the most exotic dish you’ve ever eaten? Where’s your favorite place to eat it? Share your experiences in the comments below!